Dark Arts Books’ sixth title was released at the World Horror Convention 2010 in Brighton, England! Call it what you like: dusk, twilight, sunset. It’s that magical moment between daylight and darkness when anything is possible — the evening ahead promises untold enchantment… or nameless dread. 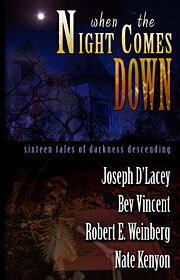 Within are 16 tales of the oncoming blackness, including more than the usual cast of characters. There are shapeshifters and gravediggers, but also supernatural private detectives and — perhaps most terrifying of all — beautiful creatures that prey on… horror writers. Murder, death — and things worse than death — are all waiting for you When The Night Comes Down. Our newest title features more of the great stories that are a hallmark of Dark Arts Books’ selections. Joseph D’Lacey, in stories like “The Unwrapping of Alastair Perry,” writes in the vein of the Clive Barker of the 1980s. Bev Vincent, already renowned for his non-fiction, shows off some impressive range in his fiction — from hard-edged horror (“Silvery Moon”) to Bradbury-esque whimsical (“Something in Store”) to knowing humor (“Knock ’em Dead”). Nate Kenyon, in gritty stories like “Gravedigger” and “The Buzz of A Thousand Wings,” showcases why he has earned all those raves. Dark Arts Books is really proud of this collection and think you will enjoy all the great stories within! 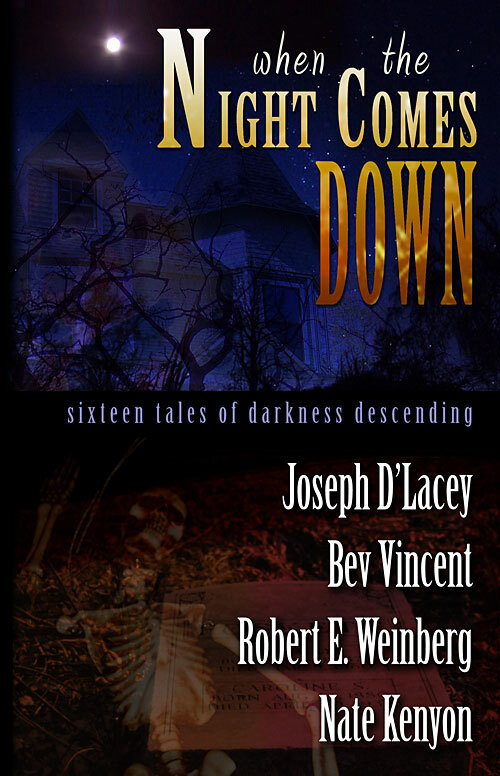 When you order a physical copy of When The Night Comes Down, you can also get a free e-book version of the book. Click the Add To Cart button above and answer the question during the PayPal shopping cart checkout process and we’ll send the e-book version your way when we ship the paper copy!